Thank you, Jeremy, for bringing up the topic of questioning loyalty to Christ. (To view Jeremy's blog, click on the link to the right.) I, too, have often thought about how much torture I could take before giving in. Have you seen this new book by Tim Wesemann? I have only just started reading it. "Right now, terrorists are plotting to assassinate a presidential candidate, my wife and daughter are in trouble, and people that I work with may be involved in both. I'm Federal Agent Jack Bauer -- this is the longest day of my life." The popular TV show 24 follows counter-terrorist agent Jack Bauer in a real-time drama in which each episode is an hour out of a twenty-four-hour day. In this groundbreaking series, the entire twenty-four-episode season equals one day in real-time. 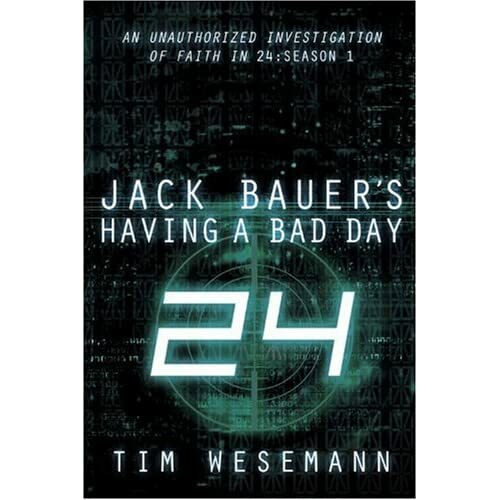 Each chapter in Jack Bauer's Having a Bad Day presents an episode from the first season along with an unexpected faith truth. Using the vivid, powerful drama of a specific scene from each episode the book engages the reader to explore the truth of God relative to core spiritual concepts of faith and apply their findings to events in the very real time of our days. The fan base of 24 is staggering -- 10 million people worldwide watch this show. Readers re-live highlights from the first season while exploring faith truths that will energize spiritual life. Christ's life-changing message is presented in a creative, compelling way, and backed by in-depth explorations of specific Scriptures that deal with the life of faith.